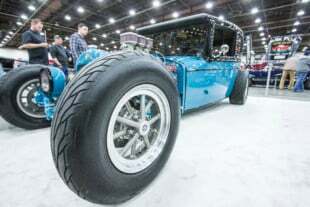 Each year the Grand National Roadster Show culminates with the announcement of the new year’s recipient of the prestigious AMBR or America’s Most Beautiful Roadster award. Regarded as one of the nation’s two most coveted titles, rivaled only by the history and allure surrounding the Ridler Award, Rod Authority was in the main hall of the event cataloging the contenders that were on display. America’s Most Beautiful Roadster is a title that we believe is granted to those who exhibit timelessness within an ever-changing reality. The question is this: How do you maintain the spirit of a classic car while delivering an overall creation that isn’t stuck in the past. An AMBR contender requires a tactful mix of nostalgia coupled with modern awe if it is to catch a judge’s eye. While car competition at this degree is a little blue-blooded for this editor’s taste there is one thing that cannot be overlooked–each build team poured their hearts, time, and money into each build. The AMBR contender represents a dedication to seeing grand vision become reality and like the Pyramids of Giza, is something that kings and farmers all flock to see. Immediately below is a section spotlighting a few of this year’s contenders. At the end of this article you’ll find a gallery showcasing the contenders that were on display. Be sure to comment on which roadster takes the cake for you and don’t forget to tell us why! Bert Diehl’s ’27 features a motor out of a Model B with a Serr-Miller overhead valve conversion. The transmission came out of a 1939 Ford and the rearend is composed of 1940 Ford bells and brakes with a Winters quick change differential. Charly’s Garage created the custom rectangular tube chassis that the ’27 sits atop. The distressed leather interior compliments the sleek Axalta Black Chroma Premier paint job. Diehl extends his thanks to Charly’s Garage, Ogden Chrome, Imagine Injection, Russell’s Polishing, Classic Instruments and Ron Davis Radiators. The Grasshopper T replica is a both an amazing testament to the past and an amazing show of talent by Galpin’s builder Dave Shuten. Our gallery features snapshots of the original vehicle’s history and a detailed list of the replica’s performance specs. Below is a brief passage from the display. The Hirsch ’27 Ford Roadster was a favorite of ours. The hand-formed aluminum nose and modified original steel body caught our attention as soon as we laid eyes on it. Other features include a polished aluminum small-block Chevy, candy paint job laid by the Chopit crew, a gorgeous ox blood leather interior by Fat Lucky, and all that show-chrome courtesy of Advanced Plating. 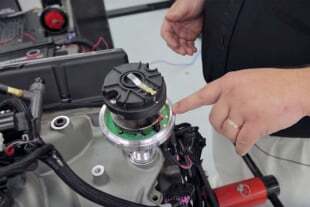 Features of the Rivet Roadster include a 392ci Chrysler Hemi connected to a TKO 600 five-speed transmission. 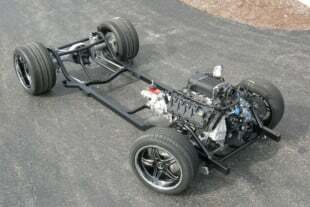 A Winters quick change rearend completes the drivetrain. Rivet panel work was done by Frank Wallic, upholstery by Autoweave Upholstery, and paint by Mike Slaughter. The recipient of this year’s America’s Most Beautiful Roadster award went to this 1933 Ford owned by Larry Olson and built by Alloway’s Hot Rod Shop. This year’s Grand National Roadster Show was definitely a big event for Bobby Alloway. From overseeing the build of 2015’s AMBR recipient to being inducted into the Hall of Fame, there was definitely cause for celebration for Alloway and his team. A snapshot of exterior feature’s included on the ’33 Alloway roadster are: A cockpit and doors that have been lengthened by four inches, front fender wheel openings moved forward two-inches, and a windshield that has been chopped two inches and laid back three inches. Chassis features include: A ’33 Ford chassis custom built by Alloway’s Hot Rod Shop, a ’32 front cross member and Alloway ET style wheels by Billet Specialties (18×10 rear, 15×4 front), and Michilin Tires (275/60R18 rear, 153/25R15 front). Interior features include: 1933 Nash gauges courtesy of Classic Instruments, the speaker out of a 1957 Cadillac, a 50s Motorolla aftermarket accessory radio, and the steering wheel off of a 1962 Corvette. 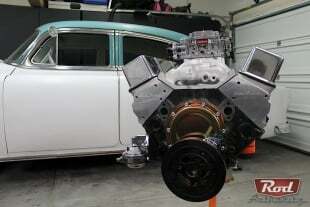 Powerplant features include: A 1955 Dodge 241ci Red Ram Hemi built by Keasler Racing, a Weiand six-deuce Drag Star intake manifold, six 97 Stromberg carburetors converted to EFI with the fuel injection hidden in the heads and under the billet valley plate. What do you think of the five closeups featured above? Which is your favorite? If you had the choice to choose which roadster was the rightful recipient of this year’s AMBR award would it still be the Alloway-built ’33 or something completely different? Post your thoughts after the gallery featuring the rest of the contenders.